It's a pleasure to be here today. 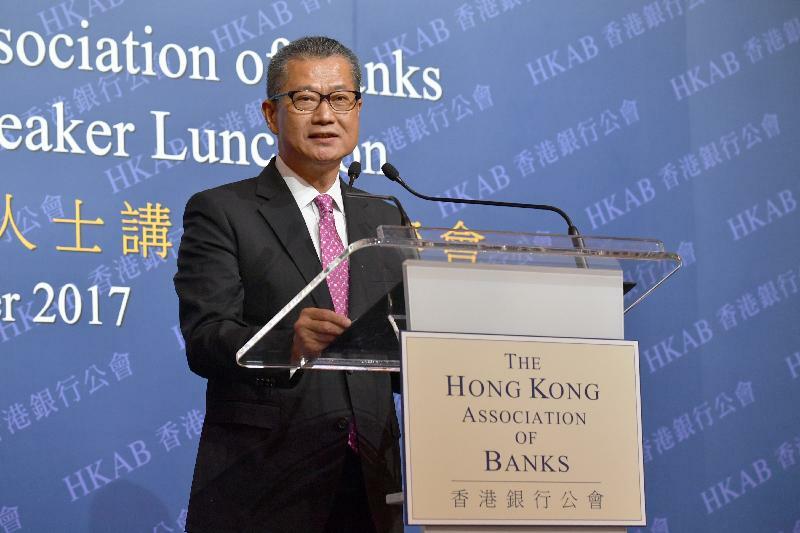 My thanks to the Hong Kong Association of Banks for giving me this welcome opportunity to speak to the institutions and the professionals who have made banking and finance one of Hong Kong's great assets. Our ticket to the future. I must say today's lunch - from the compressed watermelon and avocado pudding to the sea bass, the artichokes and the lime sorbet - was the healthiest and yet delicious business lunch that I have enjoyed in a long good while. Clearly, you want to tell me something about the decency and health of your industry and businesses. Indeed, I am glad to see that all of you here today and the banks that you manage are in a state of good profitability and good health. According to the Hong Kong Monetary Authority (HKMA), pre-tax operating profits of banks in Hong Kong grew by about 8.7 per cent last year. Given that the global economy, as well as the Hong Kong economy, have been performing much better than expected so far in 2017, I am sure that performance will be even better this year. For the first half of 2017, the total assets of banks, the deposits that they have taken and the loans that they have made all have registered impressive growth. Net interest margin has also seen improvement. Pre-tax operating profits of the banking industry have grown by over 18 per cent over the same period last year. I am happy to see that while banks in Hong Kong are making decent profits, they are at the same time maintaining prudent underwriting standards and strong balance sheets. The excellent resilience of the banking sector is one of the core strengths of Hong Kong as an international financial centre. For Hong Kong, we have built up a robust market and a strong regulatory framework over the years to safeguard the good health of our financial and banking system. Therefore it is crucial that we keep up with the international standards in regulation and risk management. We have been implementing Basel III standards in Hong Kong over the past few years. Throughout the implementation, the banking sector has continued to grow, holding strong capital and liquidity positions and good asset quality. Notably, banking in Hong Kong remains well capitalised, with a consolidated capital ratio of 18.7 per cent at the end of June - that's double the international minimum requirement. Quarterly average liquidity is also well above statutory minimum requirements. In addition, the classified loan ratio of our banks stood at only 0.68 per cent, and that speaks of the sector's asset quality. We are now working on the next phase of the Basel III implementation. It covers several revised capital and liquidity standards, including the revised securitisation framework for capital requirements, as well as Net Stable Funding Ratio requirements. We are also preparing legislative amendments for implementing the latest financial exposure framework from the Basel Committee on Banking Supervision, along with recovery planning requirements prescribed by the Financial Stability Board. I count on your support for these regulatory reform initiatives. They can only strengthen the banking sector. All well and good. But, of course, Hong Kong is one of the world's great financial centres for more than our robust regulatory regime. The Government is sparing no effort in enhancing Hong Kong's competitiveness as the global financial centre in Asia. Going forward, the Government will play a more active role as a facilitator and promoter in furthering Hong Kong's economic development. The financial services sector is one of Hong Kong's pillar industries, accounting for about 18 per cent of our GDP. We have successfully launched a host of new initiatives to further broaden our capital markets and develop our financial services industry. The Shanghai and Shenzhen Stock Connect, the Bond Connect, as well as the Mainland-Hong Kong mutual recognition of funds arrangement, are all encouraging examples of our work on this front. Apart from the Mainland, the Securities and Futures Commission has entered into mutual recognition of funds management arrangements with France and Switzerland. We have also introduced tax incentives to promote the development of the fund management industry, Corporate Treasury Centre and aircraft leasing in Hong Kong. If there are any other areas where you think the Hong Kong SAR Government should do more to create more business opportunities for you, please feel free to let me know. You know where to find me I'm sure. Fintech will be a key driver in the future growth of the banking sector. With a world-class financial infrastructure and an increasing influx of talent in this area, Hong Kong is well positioned to develop into a hub for Fintech. And I am sure that you are working together to make that happen, fast. In a recent Accenture report, Hong Kong ranked third in the Asia-Pacific in private Fintech investment, just behind the Mainland of China and India. Last year, some 140 Fintech-related start-ups were operating in Hong Kong. That's up about 60 per cent over the previous year. It helps that Fintech companies here attracted about US$400 million in venture capital investment between 2014 and 2016. That all but triples what Singapore's Fintech companies took in over the same period. Not that we are counting, of course. I am sure you are aware that we have launched a host of initiatives in recent years to facilitate the development of Fintech for Hong Kong's financial services industry. Just over a year ago, the Hong Kong Monetary Authority launched its Fintech Supervisory Sandbox to speed up the time-to-market for banks' Fintech products and services. It gives banks the opportunity to test out new technology in the real world without full compliance requirements. At the end of August, 19 bank trials had used, or completed, testing under Sandbox. We are also encouraging Fintech partnerships. For example, we teamed up with the Applied Science and Technology Research Institute (ASTRI) last September, launching an Innovation Hub to spur collaboration between Fintech firms and banks, while creating neutral ground for them to explore promising possibilities. The Fintech Career Accelerator Scheme is another ASTRI partnership. It places undergraduate and postgraduate students in Fintech projects in the banks here. The intent, of course, is to nurture both the projects and the people behind them. We are also nurturing more Fintech start-ups and talent through various supporting measures, ranging from seed funding and business guidance to networking and incubation programmes. For example, Cyberport, the largest digital community in Hong Kong, has been providing designated space for Fintech start-ups and has attracted young entrepreneurs from around the world focusing on Blockchain, cyber security, cross border payment, eCommerce, big data and AI. The HKMA has also partnered with banks in a number of Fintech areas including the use of Distributed Ledger Technology (DLT) on trade finance, mortgage loan applications and digital-identity management, as well as central bank digital currency. The HKMA organises a wealth of Fintech activities. On October 25, as part of this year's Fintech Week, the HKMA will host Fintech Day, featuring panel discussions, start-up demonstrations, workshops on DLT and Open Application Programming Interface and more. Apart from the licensing system for stored-value facilities introduced last year, the HKMA has also been working on a faster payment system scheduled for roll-out next September. The new system, enabling credit transfer, direct debit, addressing services and electronic direct-debit authorisation, will give the public greater convenience and lower costs through the availability of real-time retail payments across bank accounts and stored-value facilities. I am sure that you will all actively participate in the system, expanding services to your customers while creating new business opportunities in market segments that traditionally rely on cash, from wet markets and taxi drivers to other SMEs. We believe the use of digital technology can also make compliance more efficient and effective. That includes making greater use of technological solutions to customer due diligence. In this regard, we are now working on a KYC (know-your-customer) utility. And we are hopeful that some of these developments will help address de-risking, an issue often raised in the context of financial inclusion. Finding the proper balance in combatting money laundering while protecting the interests of legitimate account holders is, of course, a fundamental issue. I am pleased to note that recent feedback from the community is encouraging. They are telling us that customer experience is improving. Beyond the prospects and borders of Hong Kong, the sustained growth of the Mainland of China offers boundless promises to our financial services sector. The Belt and Road Initiative has been gaining much momentum in the past few years, and Hong Kong will play a pivotal role in it as a financing and professional services hub for Belt and Road infrastructure projects. Apart from facilitating infrastructure financing, we are also getting ourselves ready to welcome infrastructure project companies to be listed on our stock exchange, and to tap our Islamic finance and green finance capabilities. Another exciting new development that will create more immediate opportunities for Hong Kong is the Guangdong-Hong Kong-Macao Bay Area development. It is a key component of China's national development strategy, which brings together Hong Kong, Macau and nine other fast-growing cities in Guangdong Province including Shenzhen, Guangzhou and Zhuhai, with a combined population of over 66 million. This is the most affluent region in China, with an aggregate GDP of US$1.3 trillion, which is similar to that of South Korea or Australia. It is also the leading innovation and technology hub of China. With the completion of the Hong Kong-Zhuhai-Macao Bridge and the high speed rail (Guangzhou-Shenzhen-Hong Kong Express Rail Link) in the coming year, the flow of people, goods, capital and information between Hong Kong and the region will be greatly enhanced. Adding all these together, the Bay Area will certainly be a promising economic hinterland for Hong Kong providing considerable business opportunities, in particular for wealth management professionals. Currently we are working closely with relevant Mainland authorities in drawing up a work plan that can drive the co-ordinated development of the Bay Area, reflecting the unique positioning of Hong Kong, reinforcing Hong Kong's role as China's international financial centre and driving closer collaboration between Hong Kong and neighboring cities in developing Hong Kong's innovation and technology sector. Ladies and gentlemen, I am confident that with the continuing innovation and drive our banking sector has long shown the world, and the support of the Central Government under the unique "one country, two systems" arrangement, Hong Kong will continue to flourish in this 21st century of promise.